Blurb Description: Who would have thought that a teenager could have a successful career creating makeup tutorial videos on YouTube? For Lacey Robbins, this dream has been her reality. An up-and-coming YouTuber, she has thousands of fans and can't wait for the day when her subscriber count reaches the one million mark. And when she is offered a high school internship at On Trend Magazine, she figures that this could be the make it or break it moment. I went into this book not quite knowing what to expect. I don’t do makeup – well, not a lot of it at least. I bought my first eyeliner tube about three months ago, and before that, I had one tube of red lipstick, one pink, and a few lip gloss tubes. So if you said things like foundation and highlighter and contour, I might know what they were, but I’d have never used them on my own skin. Still, a book like this always sounds intriguing, and so I was so happy when Bloomsbury approved me to read an eARC of this title on NetGalley. 1. This book was definitely better than I expected it to be. Most books that contain bloggers, or internet content creators, don’t take the time to express what their lives are like – especially ones with a big audience. What I mean to say is, that books with bloggers and vloggers usually just say ‘I quickly typed up a post’ or ‘after a little editing’ and don’t properly explain the life like they would for say – a jock. 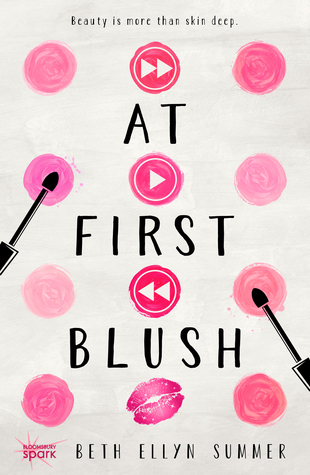 At First Blush definitely wasn’t like that. 3. I think more than anything, I was slightly mad that Lacy was willing to rep a company that was sup-par just because it was every YouTuber’s dream to be sponsored. I felt like it’s ALL about integrity. Shouldn’t she have at least tried the company’s products before trying to represent and promote them? Is that not basic sense? Why wasn’t SHE, the content creator, given the option to choose whether she wanted to rep them or not? It felt unrealistic. 4. I liked Tyler, but once again, there was nothing special about him as well. I guess my main problem with this book was the lack of the characters having anything other than a one-track personality. I liked the book, but if the main part of the plot was her YouTube channel, why was she okay to compromise on it? What is your opinion on makeup? Do you use it a lot, very little or not at all? Who are some of your favourite Youtubers? I feel like I don't watch enough and I need to start! Give me some great recs!